100% customer satisfaction not just a phrase, our mission! The Fight-O-Matic 11,000 Oscillations Per Minute Permits Speedy Trimming Of Alpaca Fighting Teeth. EVERYTHING YOU NEED FOR TOOTH TRIMMING IN ONE HANDY BOX! Alpaca And Llama Tooth Trimming Device Designed To Protect The Animal From Being Harmed. Alpaca Tooth Trimming Made Easy, Black And Decker Tool Is Awesome! Each Fight-O-Matic Replacement Cutter Can Last From 50-100 Teeth If Taken Care Of Properly. The TAMLC Is A LLama Custom Tooth Plate That Allows You To Trim Llama Teeth. This Calming Mask Is Great For Calming The Animals So That You Can Do General Heard Health. Replacement Wheels For The TAM OR TAMKIT. Sold In Pairs. Saw Wire Cuts Through Teeth Quickly. Rust Resistant. Comes In 12' Rolls Of 17 Mm (0.7") Saw Wire. User assumes all risk associated with the use of this and any farm equipment. The Fight O Matic kit comes with carrying case. 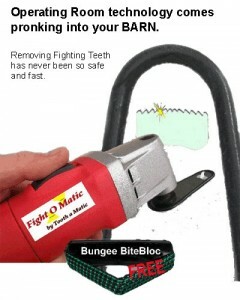 The Bungee mouth piece is an additional time saving feature of the Fight O Matic. 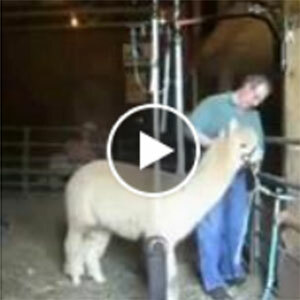 11,000 oscillations per minute permits speedy trimming of alpaca fighting teeth. Simply place the tooth through the Fight O Matic cutting tip hole, turn on the tool, pull the tool tip toward you and in less than 3-4 seconds POP! , No more fighting tooth! The design of the cutting tool, allows for very fast cutting of fighting teeth without ANY danger of cutting anything else, including YOU! The cutting edge is completely protected by rubber edging. So safe, you can tickle your tongue! seeing is believing ……. 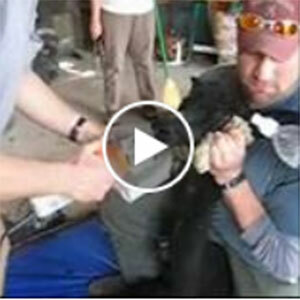 Watch the video and see for yourself! See how EASY the Fight-O-Matic is to use! First off, let me just state the Black and Decker tool is awesome…..I personally like it Better than my Dremel. LOOK at where the power switch is, right under my thumb………that’s what the Rolling Stones were talking about! 3 speeds is great for teeth, Use the lowest power speed to avoid overheating!!!!!! Finally, a small, quiet tool to detail the incisors without running the risk of bumping into the alpaca’s palate or gums. The tool was also designed to shield the dust from coming up into your face and help prevent breathing this dust into your lungs. NO MORE sanding your FINGER anymore either!!!! Since there is no risk of injuring the alpaca, it speeds up the process. Currently made with the Black and Decker 3 speed RTX rotary tool and sold with a Bungee Bite Bloc, sanding drum kit, and soft carrying bag. 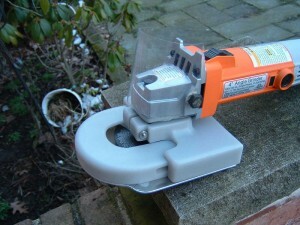 The Magnifico Protecto Guard is also sold separately without a rotary tool (no bungee Bite bloc or drum sanding kit). This protective guard will fit on Dremel tools. We have a Tooth-A-Matic and WE LOVE IT, it’s so fast and easy to use, it makes them sooo much happier to have the proper teeth trimming and that makes US so much happier, thanks so much for making this! Many alpaca breeders are breathing a sigh of relief thanks to the Tooth-A-Matic. The tool is designed for ease of use and versatility. 1) Is lightweight (4.8lbs) and runs on AC power. 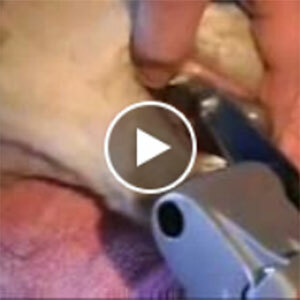 2) Easy and FAST to use – Just 2-4 seconds! 4) Eliminates stress on the human breeder too! 8) AND…Shhhhhhh…it takes the money out of the vet’s pocket and puts it in yours! If you have a special need for a special large mouth or crooked teeth alpaca, we can simply furnish you with a custom sized CNC machined plate. Place tooth hole of the base plate over teeth, turn on power, and slide the tool forward. This forward motion cuts the teeth with very little stress! Base plates with a larger standard opening are available. The larger base plate opening accommodates more irregular bites and allows for more depth of trimming and flexibility. Replacement Wheels, shims, base plates all available. 1) The initial set up of the Tooth-A-Matic is very conservative relative to trimming depth. A portion of the bottom plate sits on the bottom of the lama’s mouth limiting the depth of the Tooth-A-Matic down over the incisors. 2) A large (2” diameter) rope dog chew toy works great to hold the alpacas mouth open when using the TAM. Place the rope in the rear of the alpacas mouth to keep the mouth open and protect the tongue. 3) The lama should be well restrained; trimming teeth is never a one person job. At a minimum one other person should hold the alpaca’s head using the chew toy above. Better restraint is available using a chute or shearing restraint such as the Pro-Tie or shearing table. 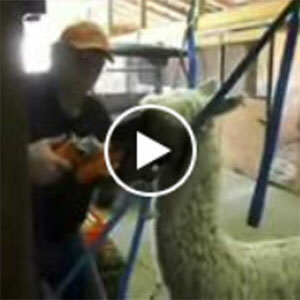 Shearing time is a great time to trim teeth because the alpaca or llama is already restrained. 4) If a halter is going to be worn while trimming teeth (such as in a chute) the nose band has to be extra-large to allow the alpaca or llama’s mouth to open properly. 5) Determine the amount of tooth to be removed in trimming prior to placing the Tooth-A-Matic over the teeth. A magic marker can be used at first to make a cutting line on the teeth. Use at chest level or lower (belt level best) for visibility and control. Use of the Tooth-A-Matic is not a blind operation; watch the cutting wheel approach & cut the teeth. 6) Place the Tooth-A-Matic over the alpaca or llama’s incisor teeth, then turn on the tool once the Tooth-A-Matic is where you want it. 7) Hold the base plate while pushing the cutting wheel ahead. This offers stability during the trim and keeps the base plate from pressing against the teeth/gums during the trim. 8) Once the teeth are trimmed I rock the Tooth-A-Matic from side to side before sliding back to round the bite just a bit. Note: the Tooth-A-Matic is only sold as a complete unit for safety reasons & cannot be adapted to other grinders.